I saw an article about slow and late payments from NHS Trusts in HSJ online magazine (27/09/18). The article alleges that according to data obtained under a freedom of information request, 44 out of 135 acute trusts paid less than half of their invoices on time during a period between 2017 - 2018. 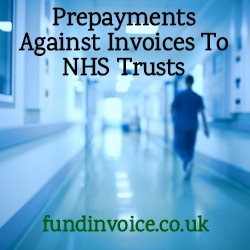 These slow payments may be causing a significant cash flow problem for non NHS suppliers to NHS Trusts, and invoice financing could be used to bridge the gap between invoicing, and getting paid. Contract regulations for public bodies require that payments are made to non NHS suppliers within 30 days. To be honest, for some businesses even a 30 day delay to receive payment will be too much for their cash flow to bear, let alone facing the prospect of a late payment. Invoice finance cuts through the red tape and gets you the major portion of your invoice values released immediately. The finance can also be accessed against existing invoices, as well as those that you raise going forwards. Therefore, if you already have an existing sales ledger of outstanding invoices to NHS Trusts (and/or other debtors for that matter), subject to some age criteria, you may be able to free up a large amount of cash from those outstanding invoices immediately. There are two kinds of funding arrangement. Firstly, to maximise your cash flow you could enter into an ongoing arrangement whereby all your invoices past, present and future (with some pre-agreed exceptions if required) fall under the arrangement and so are eligible for funding (again subject to some terms). Alternatively, if you just have a temporary cash flow problem, you could opt for a selective invoice finance facility whereby you choose the invoices to receive a prepayment against, rather than including them all automatically. Whichever option you choose, you don't need to worry about the time that debtors will take to pay. If you wish you can also opt for a full credit control service, so that you don't even have to worry about chasing up late and overdue invoices - this can be provided as an additional service by the funder.